The group’s original lineup consisted of brothers Brian, Dennis, and Carl Wilson, their cousin Mike Love, and their friend Al Jardine. They emerged at the vanguard of the “California Sound,” first performing original surf songs that gained international popularity for their distinct vocal harmonies and lyrics reflecting a southern California youth culture of surfing, cars, and romance. 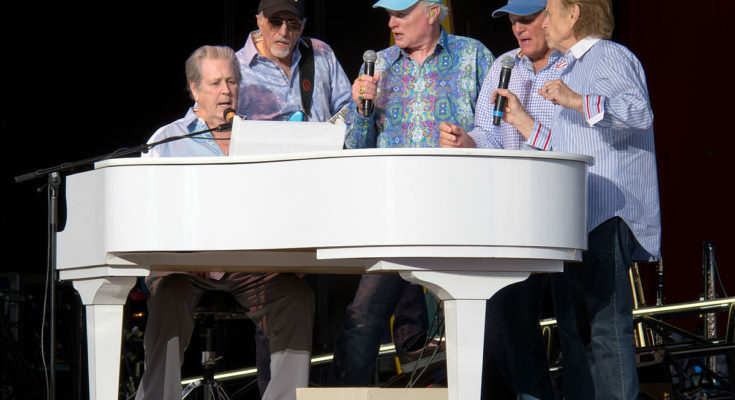 The Beach Boys are one of the most critically acclaimed, commercially successful, and widely influential bands of all time, while AllMusic stated that their “unerring ability… made them America’s first, best rock band.” The group had over 80 songs chart worldwide, 36 of them US Top 40 hits (the most by an American rock band), four reaching number-one on the Billboard Hot 100 chart. The Beach Boys have sold in excess of 100 million records worldwide, making them one of the world’s best-selling bands of all time and are listed at number 12 on Rolling Stone magazine’s 2004 list of the “100 Greatest Artists of All Time.” They have received one Grammy Award for The Smile Sessions (2011). The core quintet of the three Wilsons, Love and Jardine were inducted into the Rock and Roll Hall of Fame in 1988. Live configurations of the band fronted by Mike Love and Bruce Johnston continue to tour.